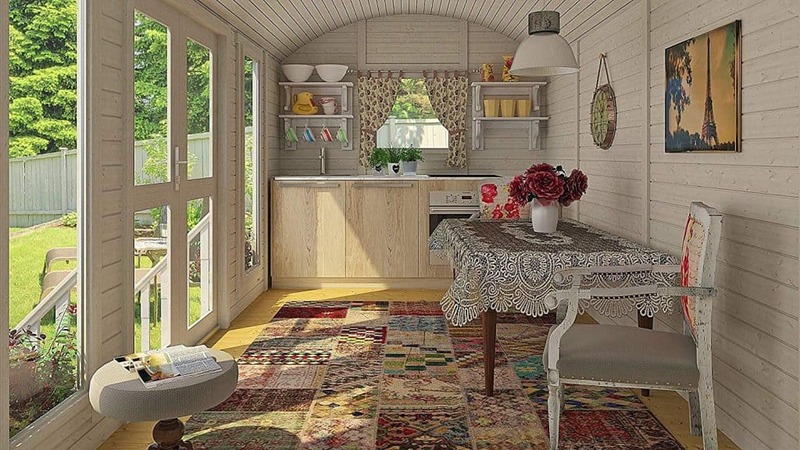 Do you dream of building your very own tiny house on wheels? Furthermore, are you short on building skills or short on time? Luckily, you can order pre-fab tiny house kits on Amazon! 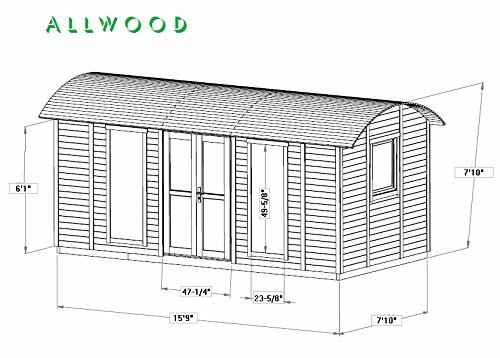 These tiny house kits require only rudimentary building skills and tools, and can be assembled within a day or two. The first two tiny house kits are small, inexpensive, DIY buildings. They can be easily converted into a simple living space on wheels. But there is more to a tiny house than just four walls and a roof. Be prepared to spend more money, and put in more work, for indoor plumbing and electricity. In that vein, we have also linked some ideas for easy electrical and plumbing solutions. So enjoy, and let your imagination fly! 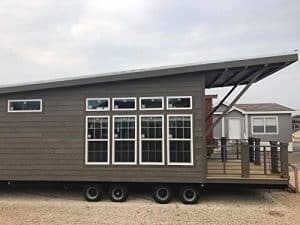 The second two tiny houses in this article are ready to go units. One fully self contained, very modern with solar and wind already wired. Secondly, a beautiful, fully equipped, 400 Sq. ft. home on wheels! Get it on Amazon, just $7,495 and free shipping. 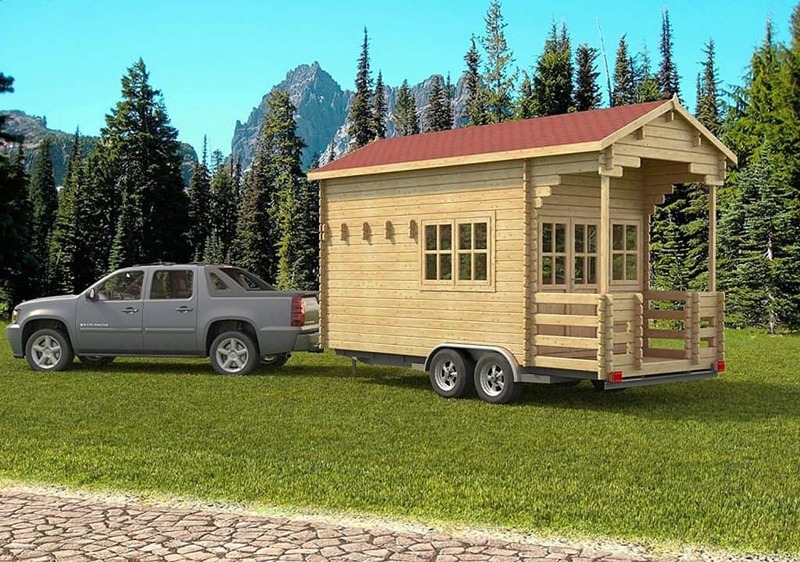 Here is a picture of a Pioneer cabin kit, all decked out for the road. Note the window shutters, a good idea to prevent rock breakage! With a small sleeping loft (with a window), the Pioneer measures approximately 19′ long and 9′ wide, and 11′ 1″ at the roof peak. Made from durable Nordic spruce wood, the Pioneer has a simple, yet classic feel, and the front and side windows will bring in plenty of natural sunlight. The small front porch could accomodate a cute bistro set, for a peaceful morning coffee or an easy lunch setting. Please note, the trailer base is not included. You can also use the Pioneer as a stationary cabin. Just place it on a foundation or on piers. Get it on Amazon, just $7,590 and free shipping. 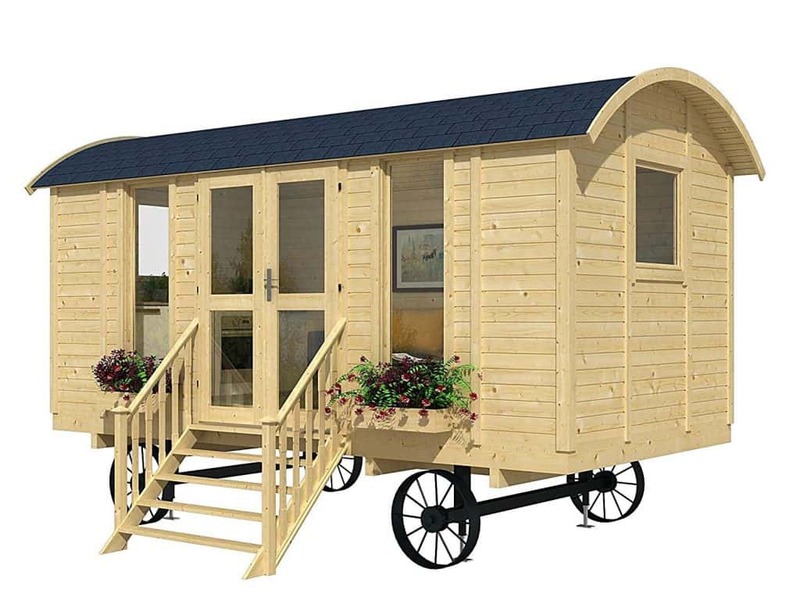 The Mayflower has a classy “sheep wagon” look, but please note, the wheels are not “road worthy”, Allwood has simply supplied these wheels, because “Structures on wheels are except from building permits in most states”. If you would like to take the Mayflower on the road, build it on a real trailer base, and also, install shutters over the windows to prevent rock breakage. Although very small in size, the Mayflower is super cute, and sure to attract envious looks! The exterior flower window boxes are included. Also, if you take the Mayflower on the road, hardy cactus might be wind proof. At 15′ 9″ long, 7′ 10″ wide, and 7′ 10″ tall, the dimensions on the Mayflower would make for easy towing and camping, and with some clever interior ideas, you could make the best use of this small space. Interior ideas for the Mayflower. 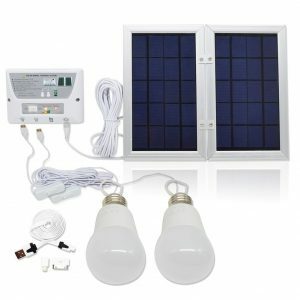 This is not a high powered solar system, but it’s easy to install, self contained and affordable. Furthermore, there is no need for electrician. It’s a plug and ply 12 Volt (low voltage) system, quick & simple to install. It comes with two super-bright LED lights, and a rechargeable battery. Above all, the light will illuminate for over 8 hours, in optimum conditions. Finally, it has a remote control for the lights, and the charge controller has a USB port for charging your cellphone. 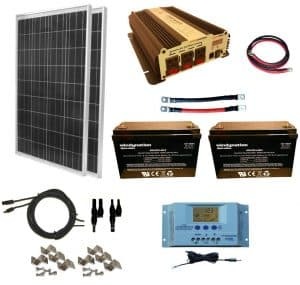 If you want to fully wire your tiny house with solar, this kit has it all; two 100W solar panels, 30Amp P30L Solar Charge Controller, 1500W VertaMax 12VDC to 120AC Modified Sine Wave Power Inverter, a 200amp-hour battery bank, and ll the wires and connectors you will need! 200W will be ample for moderate electrical needs, such as running a laptop, and a small TV. Get it on Amazon, $989.99 and free shipping. This fits on a countertop. It’s just 31″ H x 24″ W x 18″ L, and uses the small 1 lb. propane bottles. Also, it can be adapted to a large 5 gal. tank. The oven heats up to 400 degrees, and fits a 9″x13″ pan. The oven runs for up to 5 hours on a 1 lb. bottle of propane. Weighs about 38 lbs. 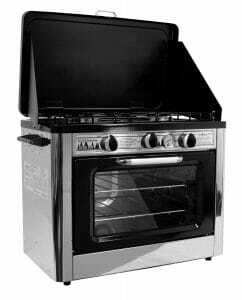 The oven is designed for outdoors, so only use in a well ventilated area! Get it on Amazon, currently $151.00 and free shipping. No need to wire into the grid, with this versatile little refrigerator! It can run off your solar panels or your propane. No compressor, no mechanical moving parts, no vibration, low noise, no Freon. Easy to transport, no worrying about slanting, perfect for a mobile environment, such as an RV, van or tiny house. Simply attach a garden hose and a 20 lb. propane tank, which you can also use to power your stove and heater. 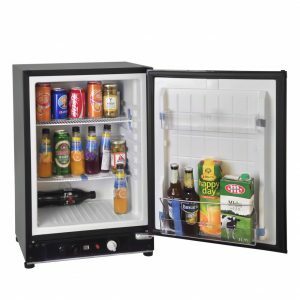 The L5 is capable of reaching temperatures between 50 to 140 degrees Fahrenheit. This model includes an electronic ignition powered by 2 “D” cell batteries making it great for off grid. 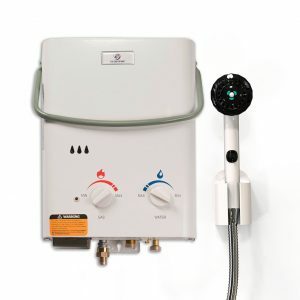 Also compatible with the Eccotemp EccoFlo 12v Pump and Strainer. Get it on Amazon, $109.99 and free shipping. A very clever design! 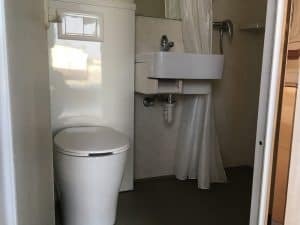 The waste water from the sink is used to flush the toilet. If you were to use this in a mobile tiny house, you would need to secure the cassette units to the floor, possibly in a sort of cabinet, which can open to remove the units for refilling and disposal. 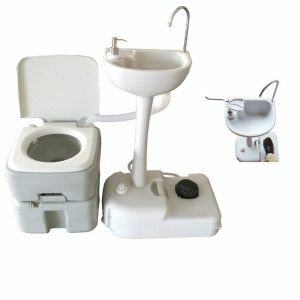 The tank at the bottom of the sink holds 19 liters (5 gallons) and the toilet holds 10 liters (2.6 gallons). 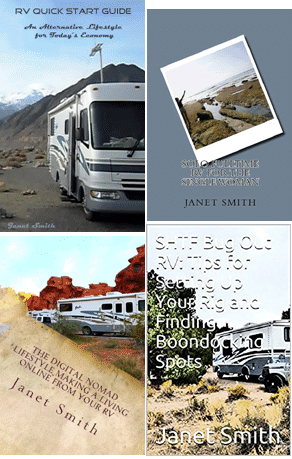 It’s small, but if you plan on frequenting campgrounds with vault toilets, it could work. Get it on Amazon $135.99 and free shipping. This fully waterproof and proof wind resistant outdoor changing and shower tent will keep you in full privacy for an outdoor shower. The pop up tent sets up in seconds, and is just as fast to take down. 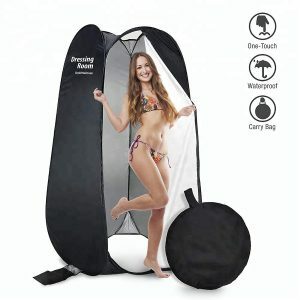 We’ve created this portable changing and shower tent to take anywhere, with its light weight carrying case, making it the ideal mobile dressing and shower tent. Get it on Amazon, just $36.88. This ceiling fan is easily adapted to tiny house living. It can run off your solar power batteries, or a rechargeable USB battery. It comes with 5 plastic blades, and 2 extra, in case of breakage. 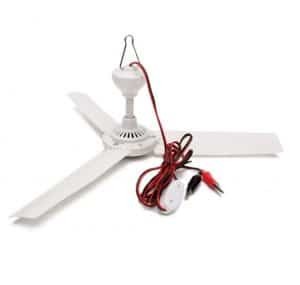 The 12v fan can directly connect into your DC wiring into your solar system. Similarly, connect it to it’s own small solar panel. Get it on Amazon, just $14.95. 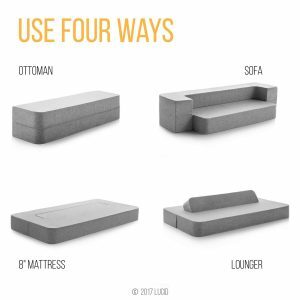 This foam mattress from LUCID offers comfort, with a thick, 8 inch layer of high density support foam. It also folds into a floor sofa, an ottoman, and a lounger. A durable polyester cover resists wrinkles. Finally, it has the contemporary look of linen. It certainly makes a stylish and versatile addition to any tiny house. For convenient delivery, the mattress is compressed, and shipped in a box. Foam is CertiPUR US certified for safe materials and physical performance. The cover is 100 percent polyester, and can be spot cleaned. Get it on Amazon, $234.99 and free shipping. This heater runs for approximately 4 hours on a small, 1 lb. propane bottle. 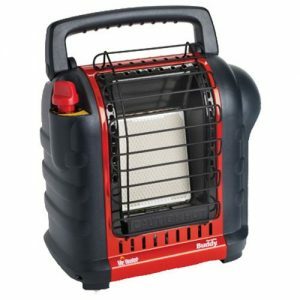 Furthermore, with an additional hose kit, it’s easily adapted to run off a large, 20 lb. propane canister. (A 20 lb. canister can also run your water heater and stove/oven). With its low-oxygen shut-off and tip-over safety shut-off systems, this heater provides safe, reliable heat anytime, anywhere. Get it on Amazon, just $69.84. The Weizhengheng, Solar & Wind Powered, Fully Equipped! Folds up and expands with hydraulics. Get the Weizhengheng on Amazon, just $23,800 + $1,000 shipping. The Weizhengheng tiny house ships from China. 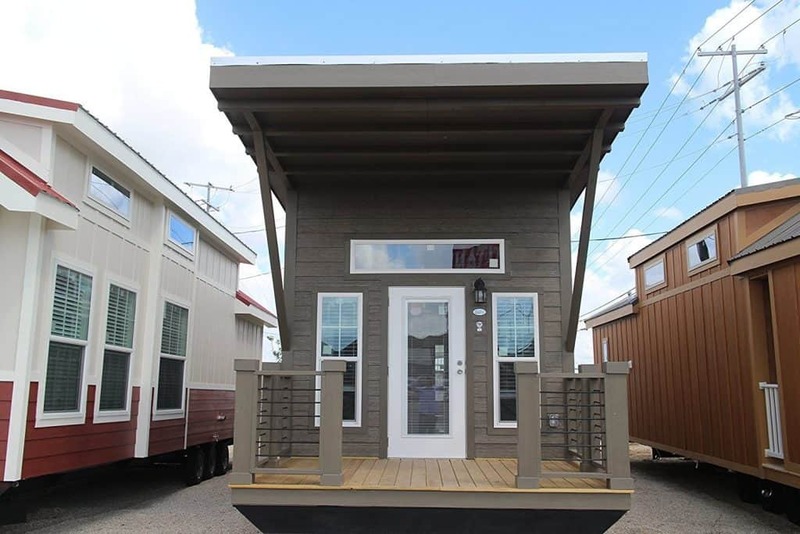 Additionally, this expandable container house is fully furnished. 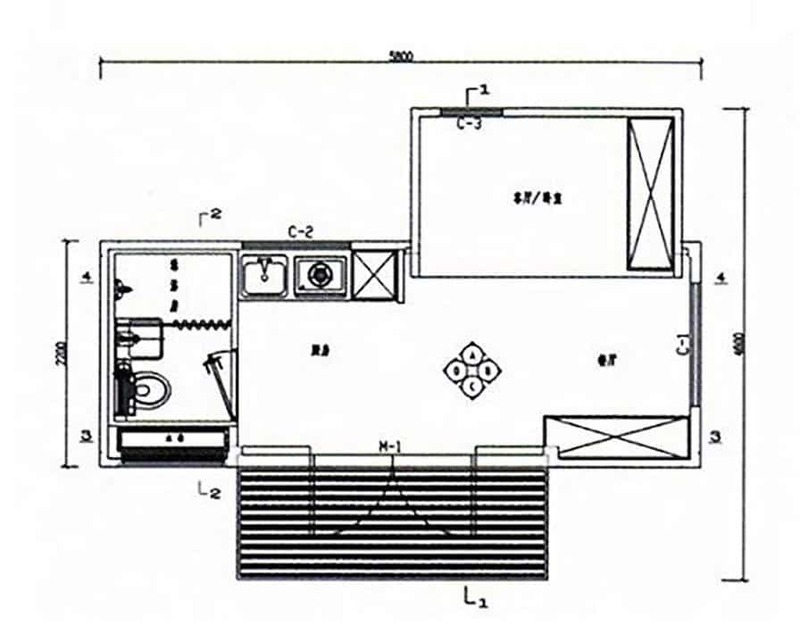 The interior has a shower and toilet, kitchen, bedroom, dining table, and energy-saving air conditioner. When it arrives, you just need to pull it out from the shipping container, and using the remote control to expand it, it’s ready to live in! 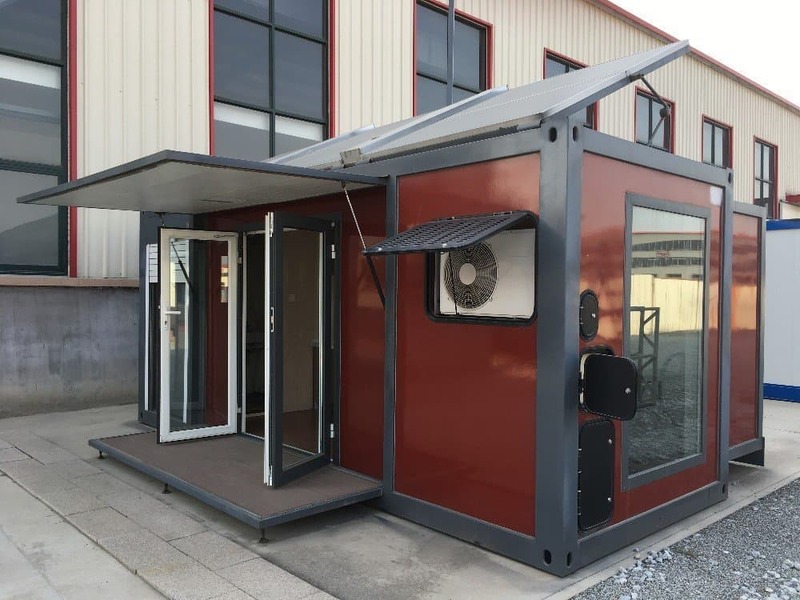 The Weizhengheng could be a perfect tiny house solution, ready to go at your off grid home site. 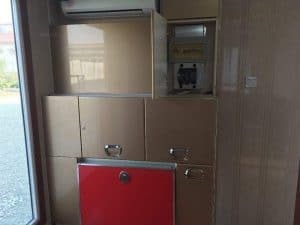 If you want to travel with the Weizhengheng, in addition to bolting it onto a trailer, you may also need to devise a support for the expandable portions, and also, install waste tanks for the toilet, shower and sink. Cabinets inside the Weizhengheng have a sleek, modern design. Additionally, the Weizhengheng has durable and attractive, composite exterior fiberglass walls. Finally, the interior has ample cabinet space, with locking cabinets that won’t fly open on the road. At $23,800 + $1,000 shipping, the Weizhengheng is a bargain! It is already fully equipped with 250W of solar. If you add a trailer and tanks, this unit could still come in cheaper than your ordinary travel trailer. 399 SQ. FT. of Luxury Living! Get the park model mobile home on Amazon. $64,900 + $4,800 shipping. 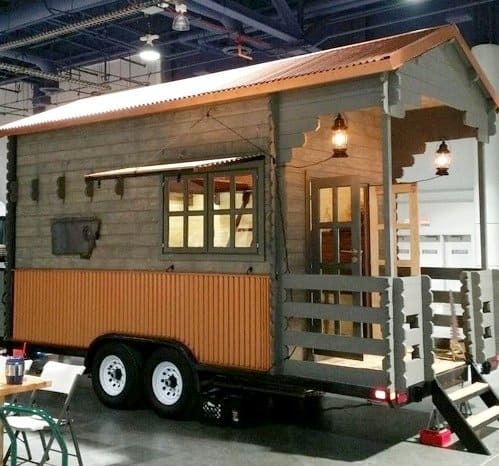 This is by no means an inexpensive or bare bones option for “tiny house” living, but a fully equipped home on wheels, designed to be moved from RV park to RV park. 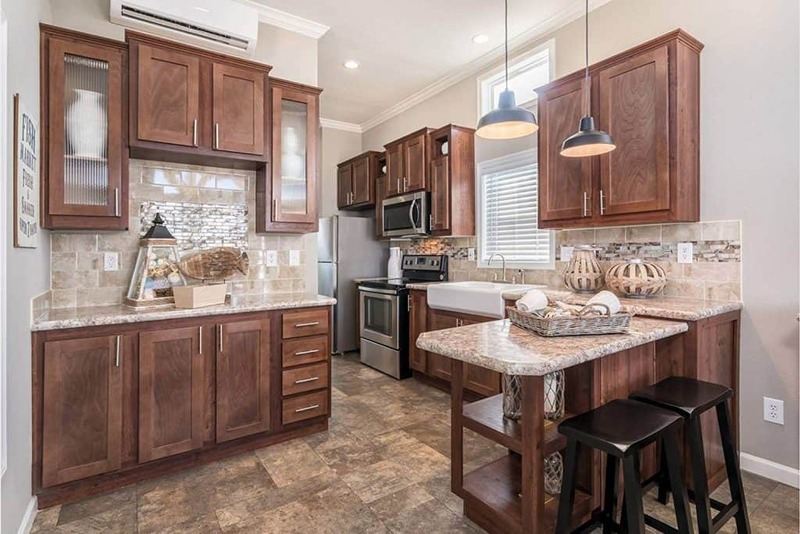 Gorgeous full kitchen, bath, bedroom, and covered front porch. The dimensions are 11′ 2″ wide, 40′ 2″ long, so this may not be a rig to tow regularly. This should be towed and left in place, or moved only occasionally. 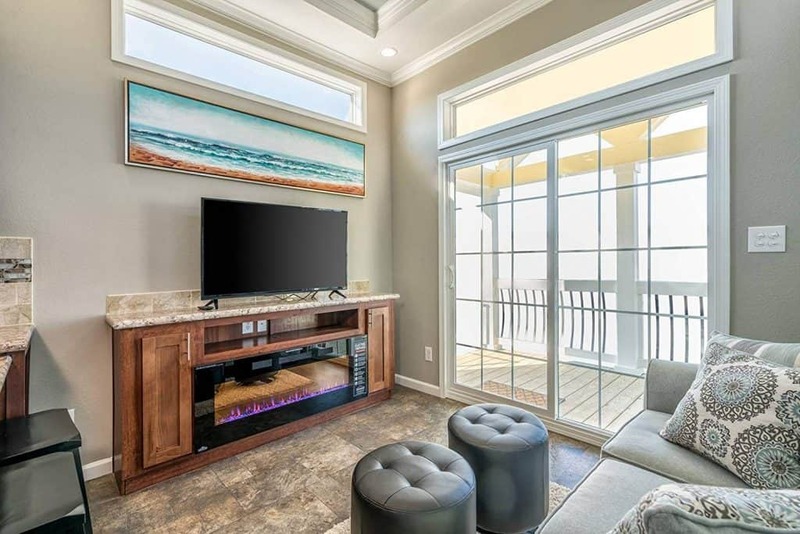 The Park Model living room. The Park Model floor plan.